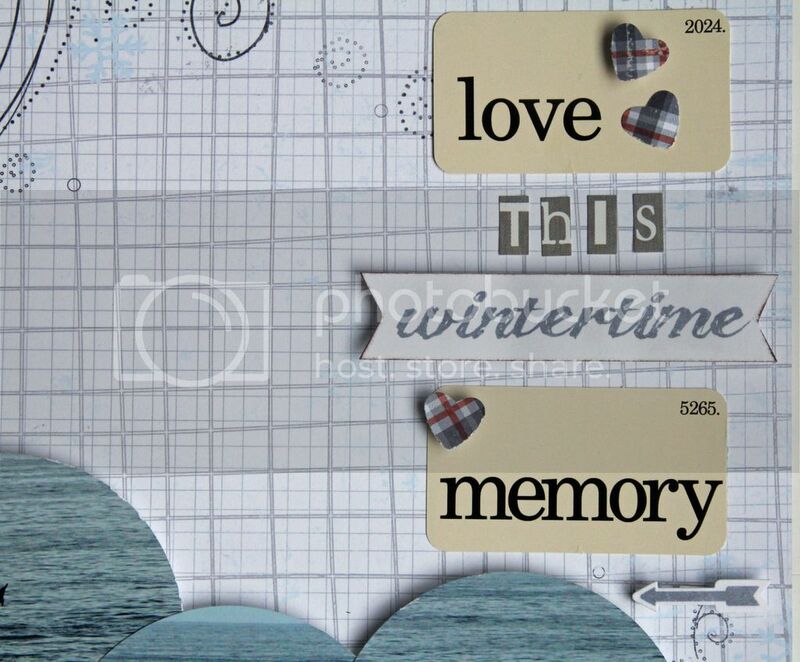 Rosie here, to share with you my projects from the December 2016 kit featuring the lovely "Wintery" by Authentique line. I decided I wanted to create a card background with a bokeh effect so I began with white card stock and Tim Holtz Distress Ink in Mermaid Lagoon, Blueprint Sketch and Faded Jeans blending each colour into each other until I was happy with the intensity of each colour. I then used my mini distress ink tool to apply large circles of metallic paint and dried with my heat tool. Once dry, I created the small circles directly on the paper with the Silver Metallic Paint Dabber. 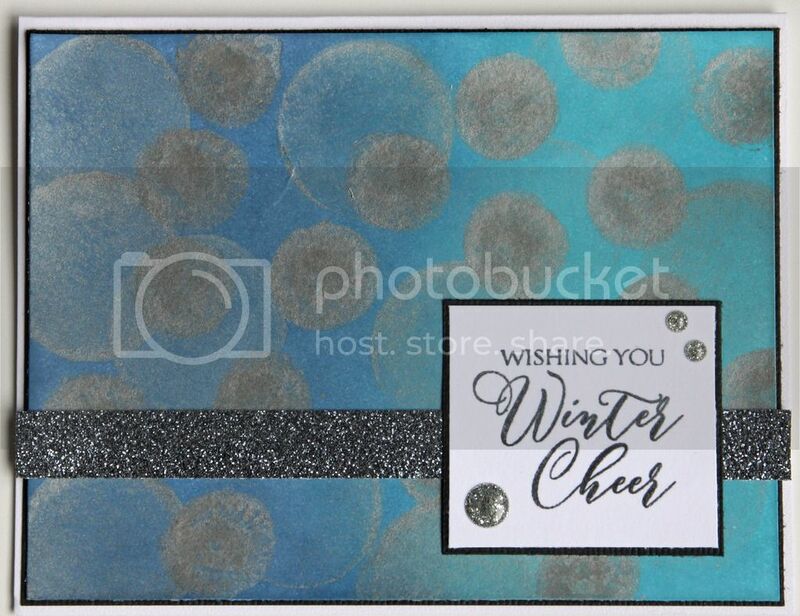 I stamped the sentiment with the Penny Black "Yuletide Wishes" stamp set in Hero Arts Ombre Vintage Metallic Steel pigment and heat embossed with Ranger Clear Embossing Powder. I grounded the sentiment block with a piece of Best Creations Glitter Card Stock, I love this card stock, lots of glitter with none of the mess, I try to keep a healthy supply on hand during the Christmas season. A few kit glitter dots finish off my first Christmas card for 2017 ;)). 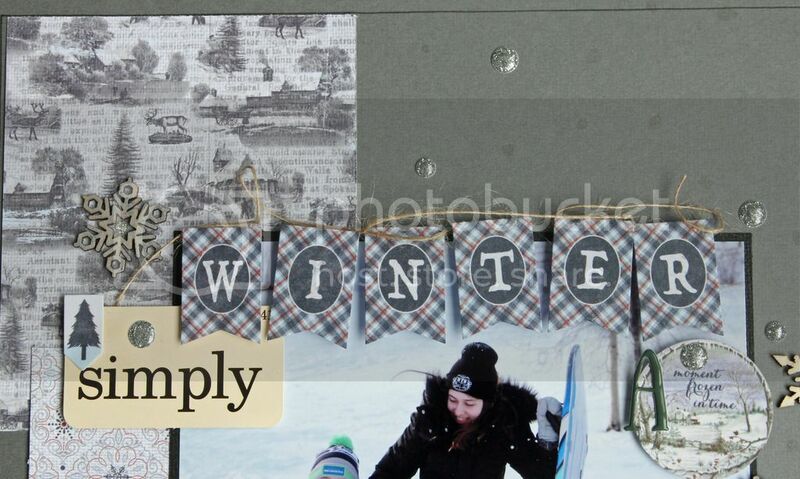 This project fits this paper line to a 't', with a photo of two of my kids sledding. 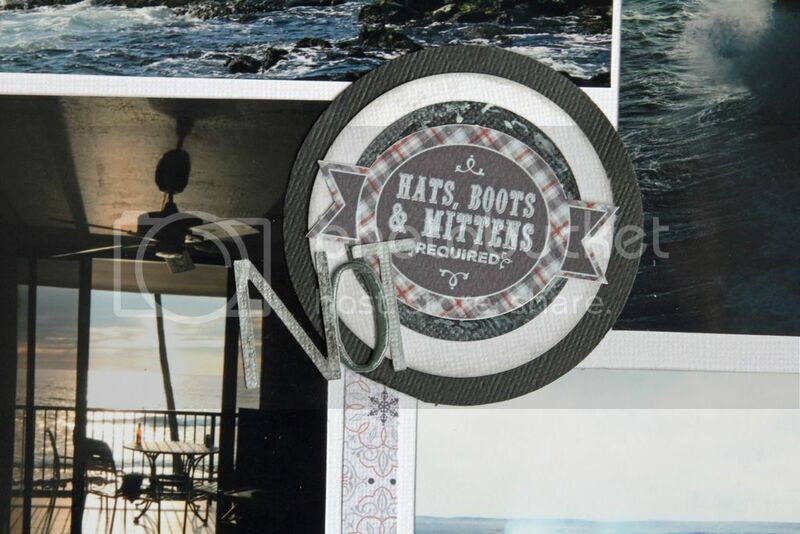 I layered off cuts of three different patterned papers under my matted photo. 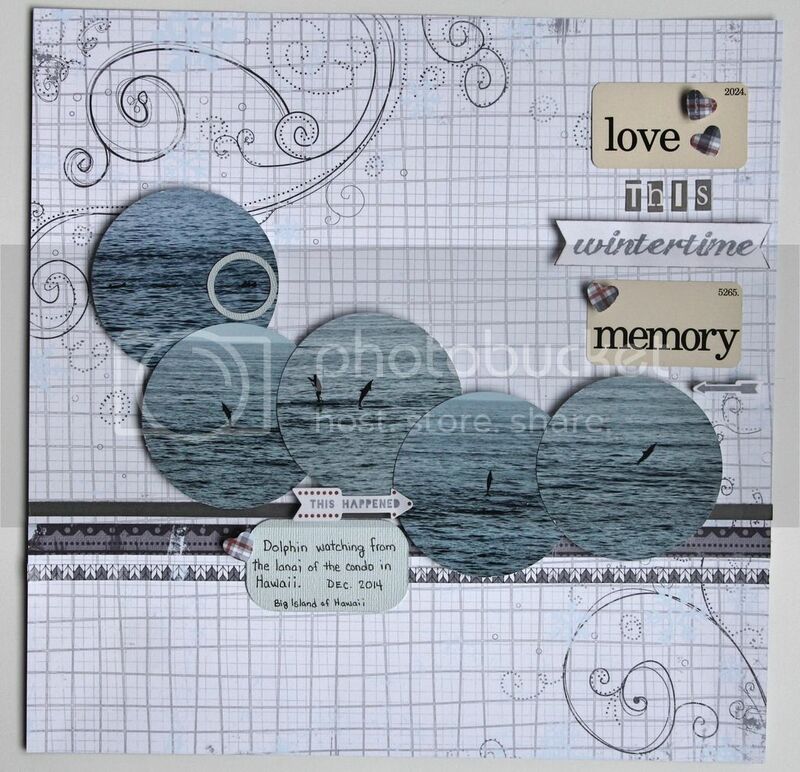 The title is created with one of the kit Tim Holtz Idea-ology flashcards and kit stickers. The twine around the flag stickers is from my stash and I painted some of the kit snowflakes with the kit silver metallic paint. I also used my Wink of Stella glitter marker to add some dots of watermark like glitter to the page and hand drew a border with a black marker as well. 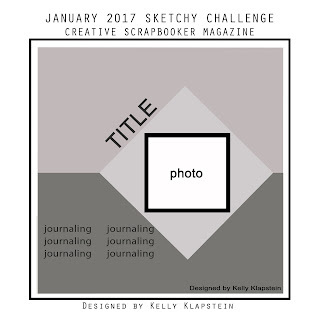 I love the angles in the sketch, especially the angled title. I created a focal point photo by closely cropping 5 photos and lining them up together to look like one photo. The cropping was a great way to deal with the heads and unknown faces of other kids in my son and daughter's Christmas concert. The cluster of snowflakes are painted with the kit metallic paint and Candied Apple Distress paint. 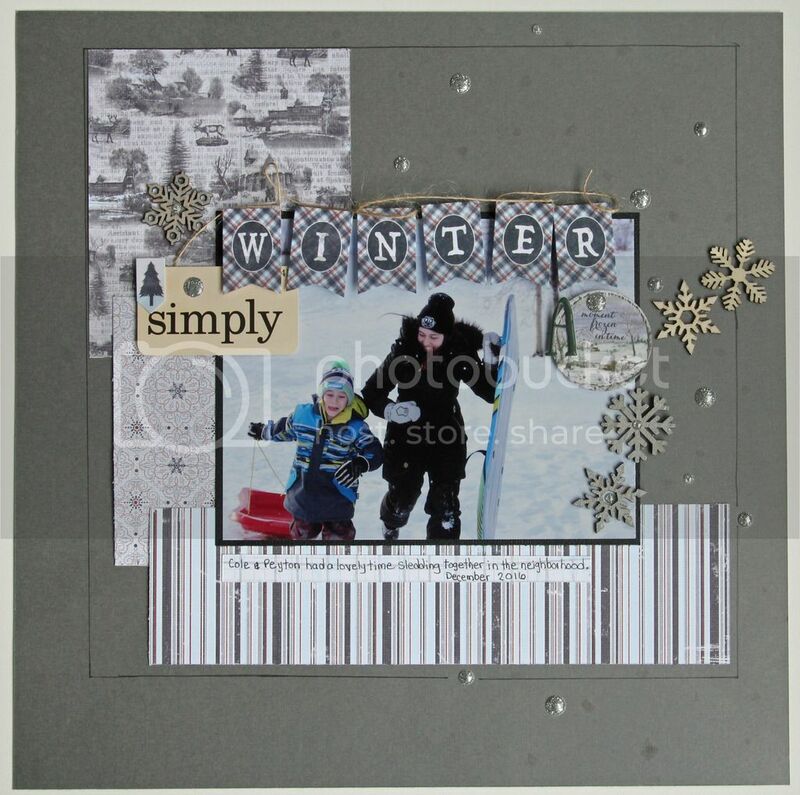 A kit flashcard, alphas and die cuts combine with the snowflakes to echo the sketch angled titled. 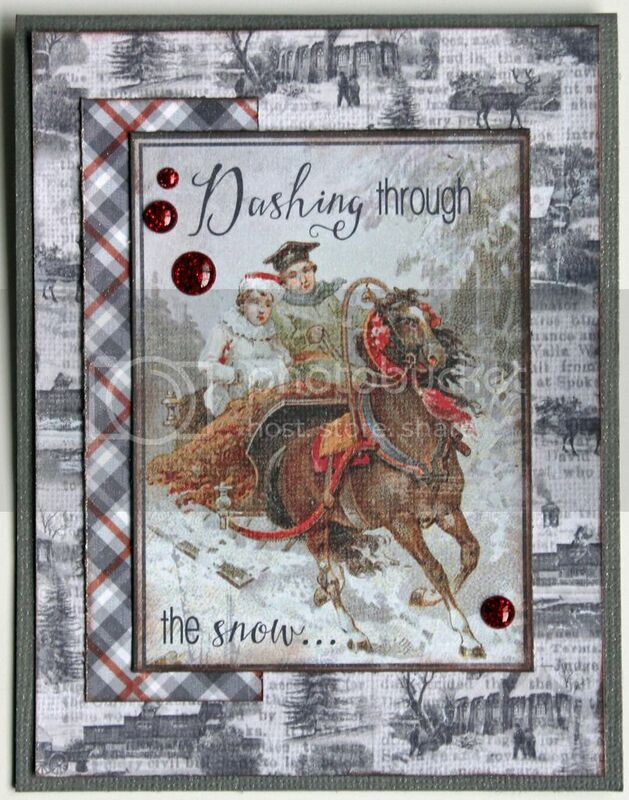 The painted snowflakes are also accented with the kit silver and red glitter dots. 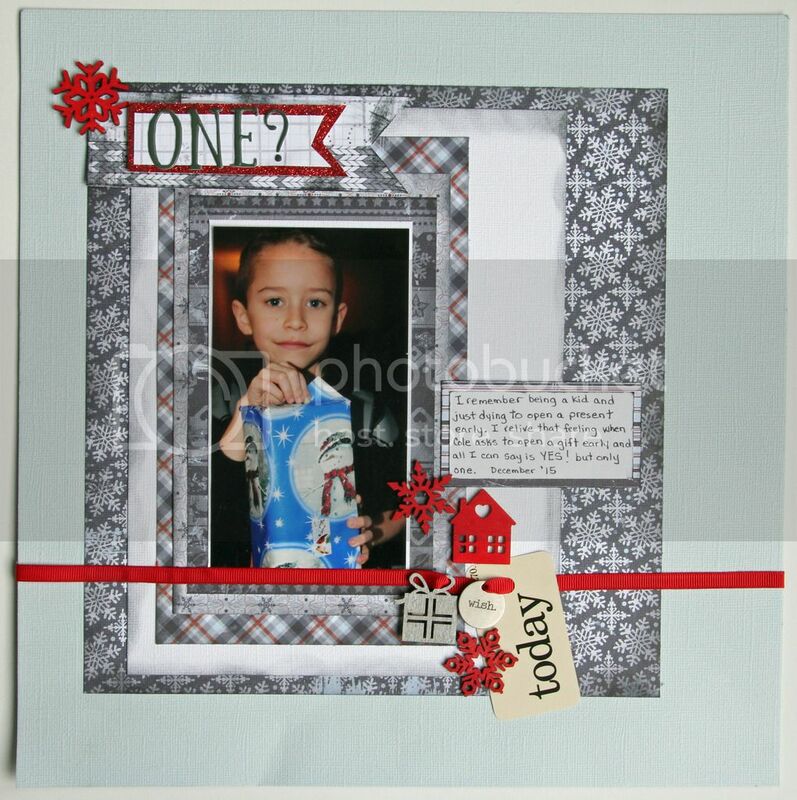 You'll see a lot of pops of red in my projects this month, I was in love with the grey and red colour combination :). This sweater patterned paper feels like a big, warm hug doesn't it? 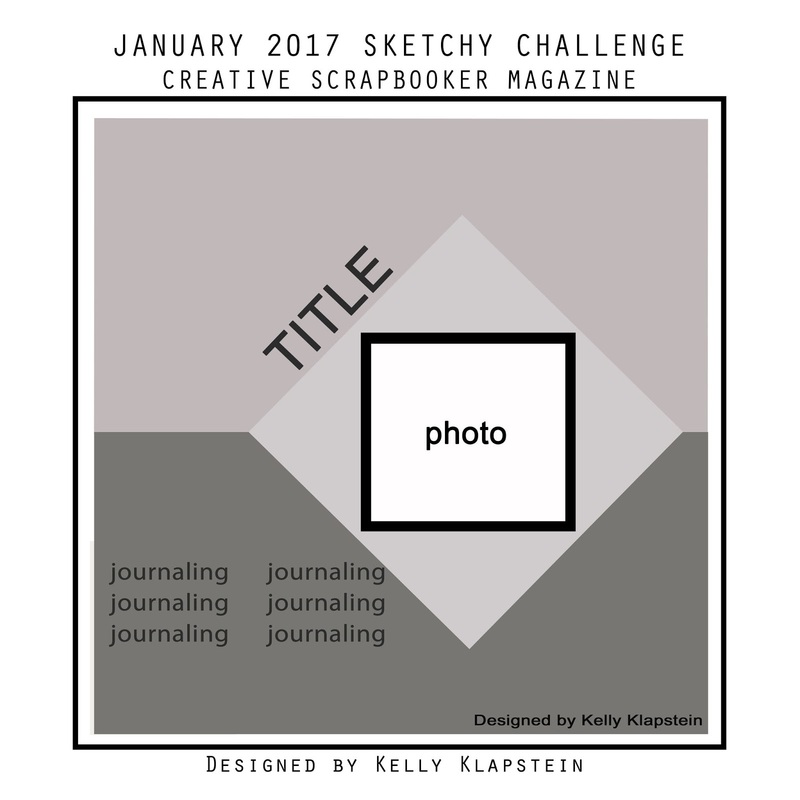 The 3x4 cards were my inspiration for the title of this layout, kit alphas finish off the title. The patterns of this kit work together so easily and there is that colour combination of red and grey again :). The add-ons are the house and the present painted in Distress Paint Candied Apple Red and Silver Metallic Paint Dabber respectively. 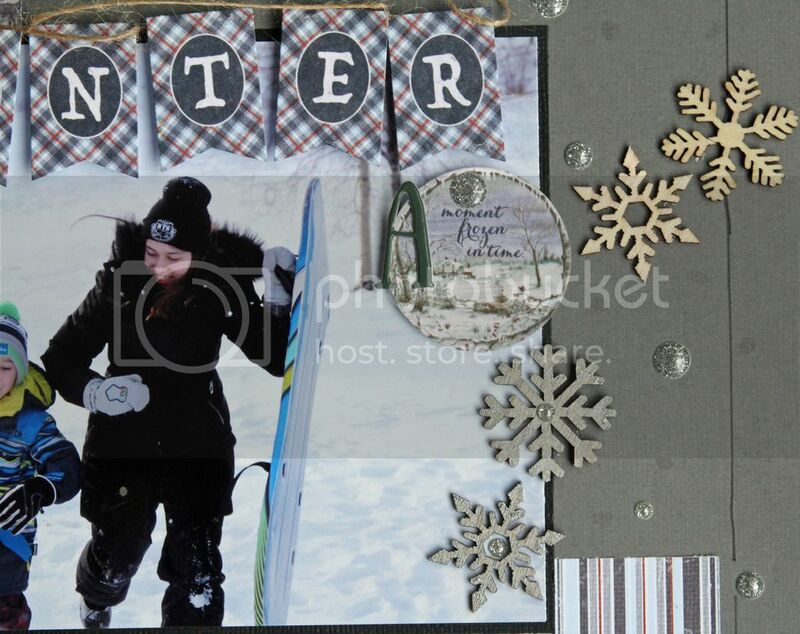 The metal 'wish' token, snowflakes, flashcard and papers are from the main kit. I added some SU red ribbon and glitter card stock, the edges of the patterned papers inked with TH Black Soot Distress Ink and the mini ink tool. I have to be honest, I am not terribly pleased with the end result, feels like it's still missing something know what I mean?? I will happily take your suggestions on the finishing touches that are missing ;), so please comment! 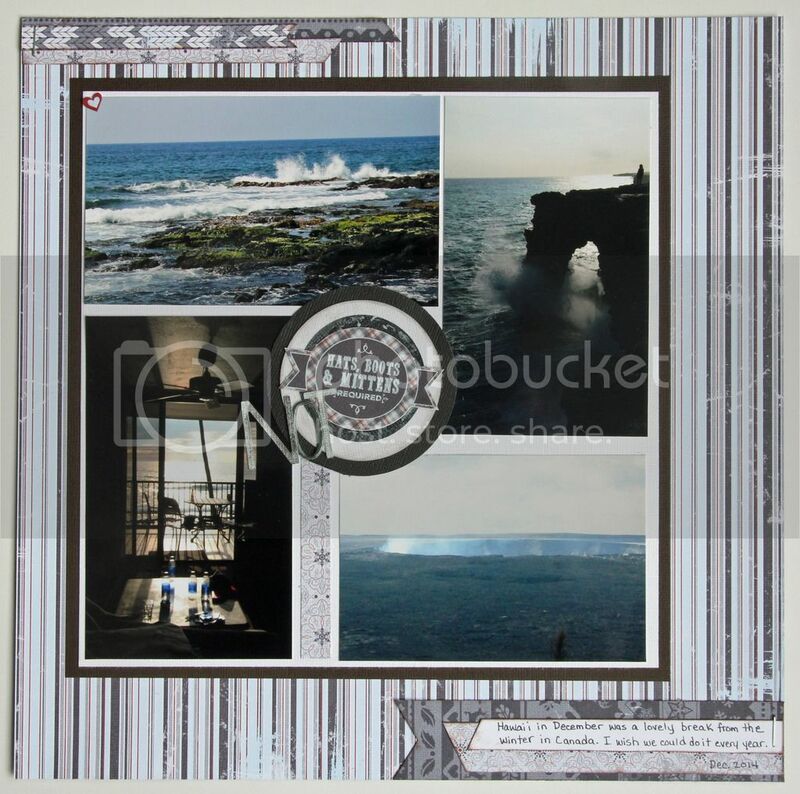 The colour palette of these papers are quite neutral so they work really well with these photos of our Hawaiian vacation 2 years ago. The blue-grey colour of the photos works really well with the blue-grey of this paper in the kit. I put my circle punch to good use cropping the photos to highlight the dolphins which are the subject of my photos. The kit flashcards along with a kit sticker and alpha stickers from my stash combine to work perfectly creating the title for this project. I punched the mini hearts with a punch from my stash. 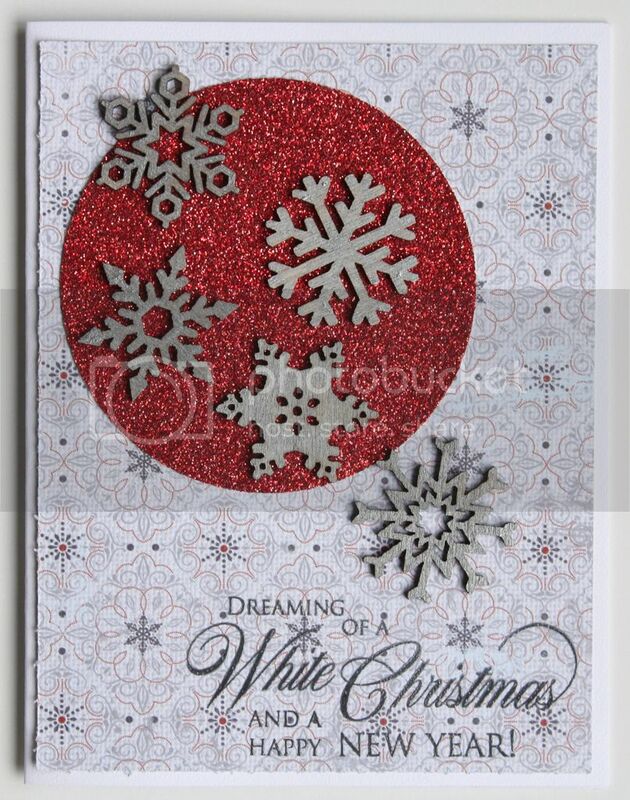 This red glitter card stock provides the perfect base for the silver metallic snowflakes. A Penny Black 'Yuletide Wishes' embossed sentiment makes this a lovely Christmas card for the coming year. 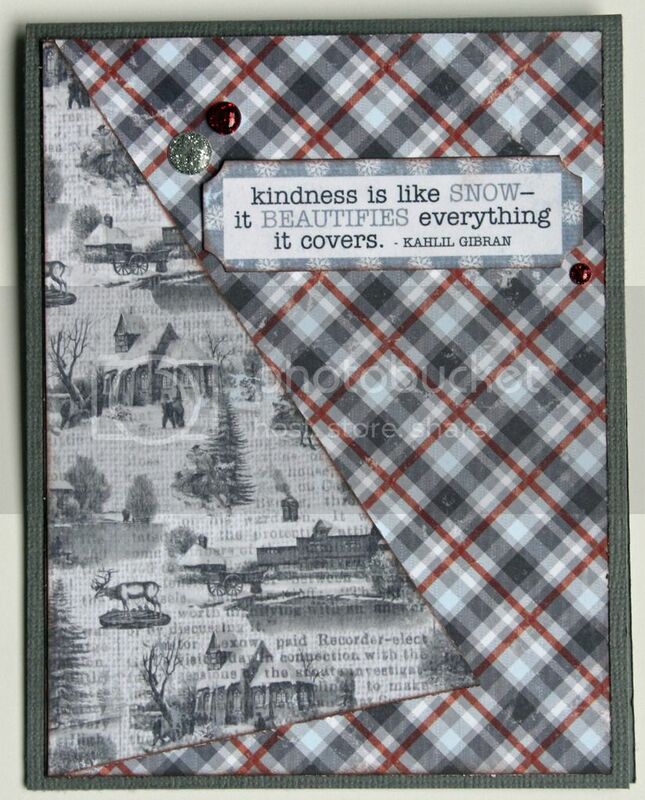 One of the kit paper's is a sheet full of 3x4 pieces like this card front. I've inked the edges of the papers and misted with a shimmer spray which is impossible to capture here. 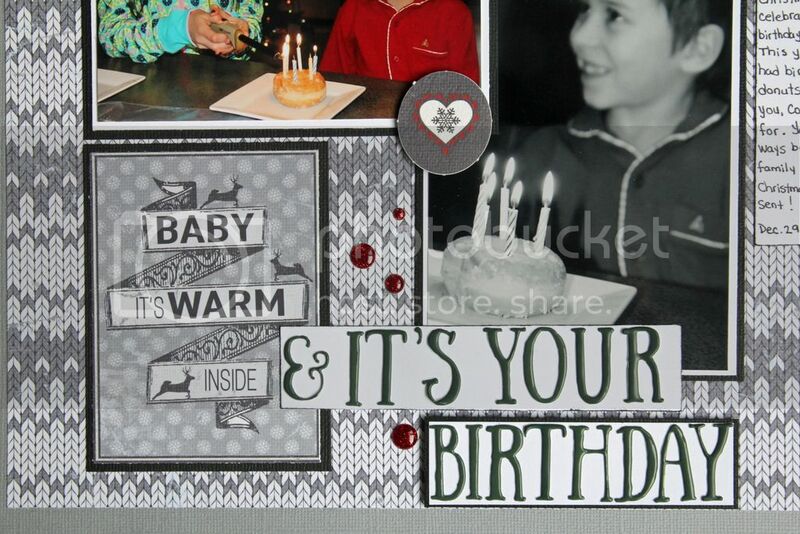 Some red glitter dots finish the card off. I inked the edges of the papers and the sticker sentiment to make them stand out. 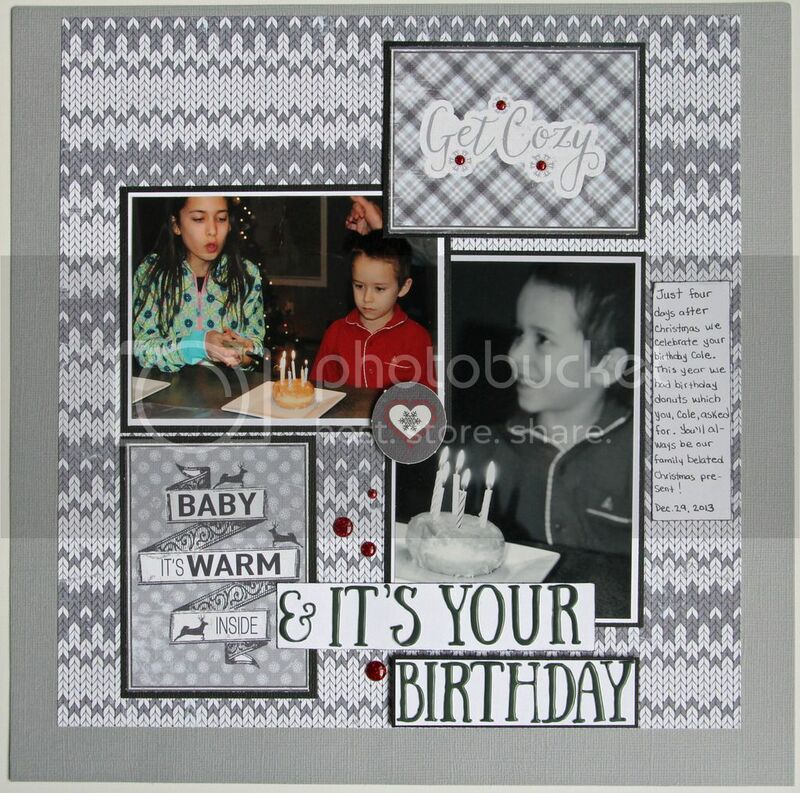 All the patterns in this kit work so well together as you can see in this card and in all the projects! Thank you so much for taking the time to stop in and have a look at these projects!